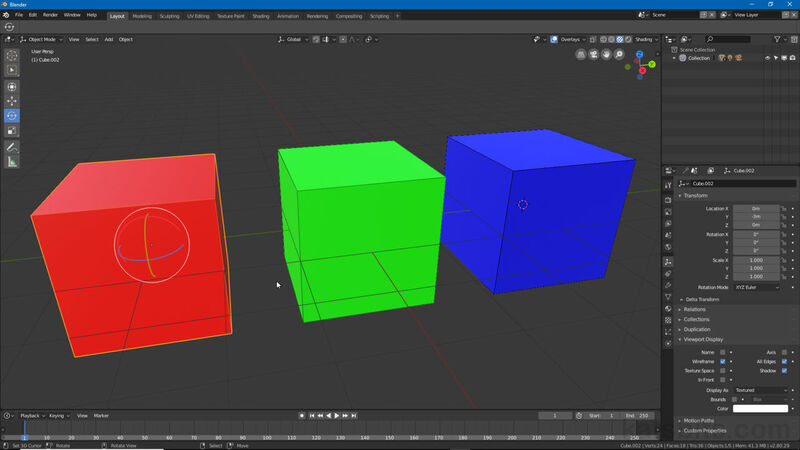 In line with other aspects of Blender 2.8’s interface reorganisation, Pivot Point, the option indicated by the Transform Widget (3D Widget), that sets the location around which Objects and selections transform (translate – G, rotate – R, scale – S) and , has been moved and grouped centre-top of the 3D View with other scene manipulation related options and settings. As part of this collection Pivot Point sits to the right-side displaying Median Point as the default option. Design note: for Blender 2.8 using the . (period/fullstop) shortcut key activates the Pivot Point pie or wheel menu instead of switching to 3D Cursor as per previous versions of Blender. Similarly , (comma) now activates the Transform Orientation pie menu, it no longer switches to Bounding Box Center. Pressing . (period/fullstop) opens the Pivot Point pie menu instead of setting the pivot to 3D Cursor per previous versions of Blender. Similarly pressing , (comma) opens the Transforma Orientation quick access pie menu rather than setting Bounding Box Center as the pivot. The Pivot Point menu located centre-top  displays Median Point  as the default option around which objects and selection will transform when manipulated , effecting the intended outcome (a shape will deform differently depending on where the Pivot is set). To use simply click the menu and set the position around which subsequent transform actions are to be focused or rooted, if 3D Cursor is set and located elsewhere in the scene for example, it will result in a different outcome when scaling an object compared to Active Element or other option being set. Active Element: Origin of LAST object selected. Median Point: location averaged between objects (single/group). Individual Origins: individual object Origin (single/group). 3D Cursor: position of the 3D Cursor. Bounding Box Center: centre of selection volume (single/group). Design note: to manually place the 3D Cursor its position can be snapped to an object or selection, i.e. Object » Snap » Cursor to Selected, or manually placed using 3D Cursor XYZ coordinates, View » Toggle Sidebar » [3D Cursor subsection] (N). Median Point and Bounding Box Center differ in that the latter is determined by the total area a selection or group occupies when represented as a simple cubic volume or box, this can make the two options appear similar whilst not being the same. Using the different options available under Pivot Point objects can be transformed, that is scaled, rotated or moved, around various centres or positions based on single item or group selections, or the 3D Cursors position in the Scene.